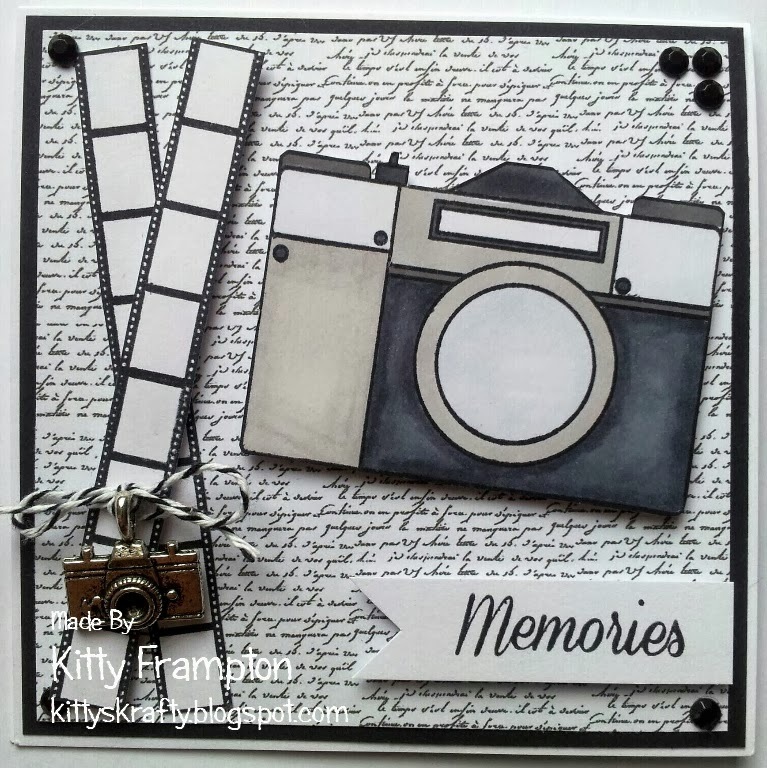 Hello, Kitty here with a fun and fast quick make i whipped up. I decided to go all monochrome for this card and kept it simple so it could be for the awkwards males in our lives! The background paper is from the Simply Sweet CD Rom although you could also use the Script stamp if your super good at lining up! The camera, filmstrip and sentiment are all from the Camera Stamp Set which you can pick up for only £3 - total bargain! It is also perfect for smashbooks and mini books too. I added a charm and some pearls. Now i have to go buy more Grey Copics as they all ran out when i did this...oopsy! 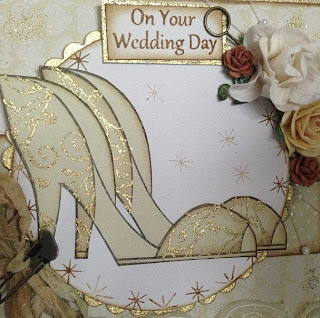 I've got a lovely shaped card to share with you today - something which I've also provided as a freebie! On this card, I've used the freebie shape (below). 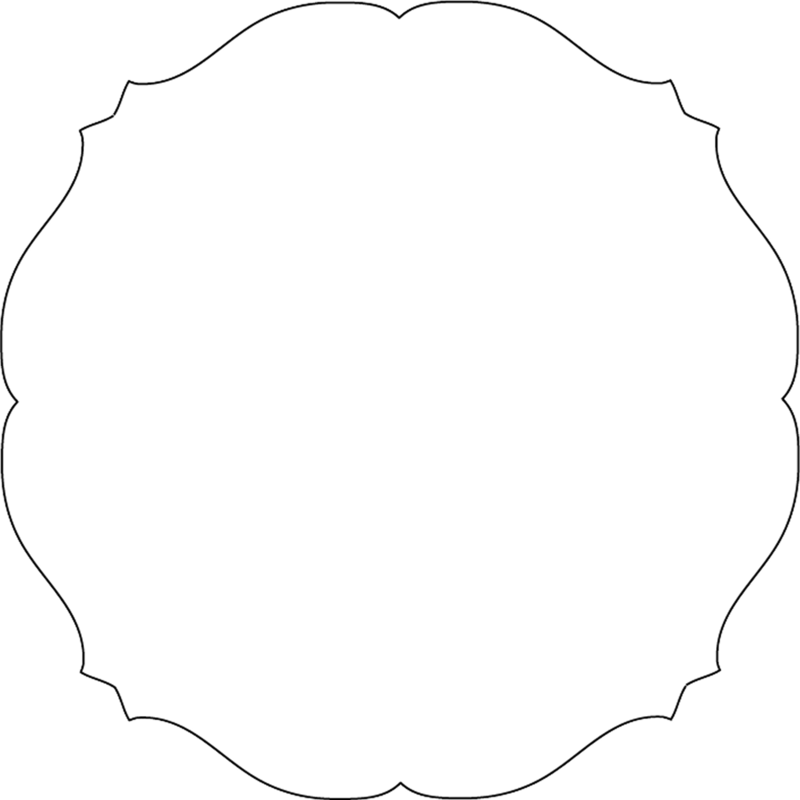 To create the layers, I simply resized the shape to different sizes to create my layering pieces and the topper plaque. The pink paper is from Christmas Extravaganza CD Rom and the blue papers are from Out of the Ordinary CD Rom. 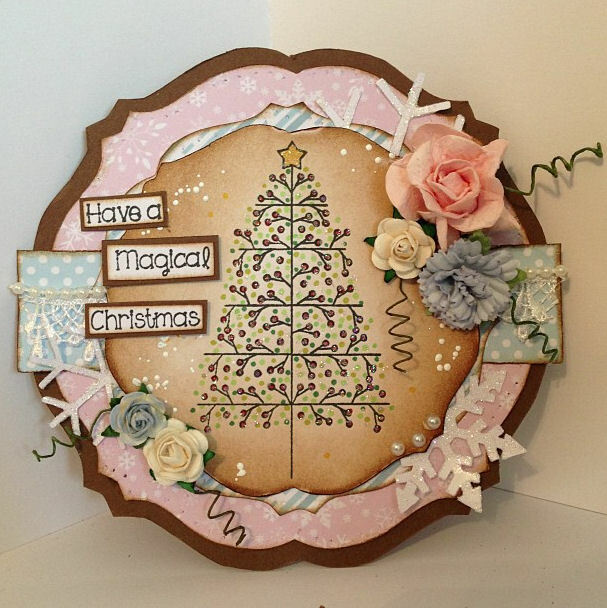 For the topper, I stamped our Berry Tree onto white card. I laid the topper onto a large acrylic block and distressed from the edges into the centre using Gathered Twigs distress ink. I managed to make it quite even & LOVE the effect it has given. I then added dots around the branches using a variety of green promarkers, a red promarker for the berries & yellow for the star. I added extra dots of colour around the image too. To add the white dots, I used the White Encrusted Jewels Fran-táge kit (LOVE THIS!). 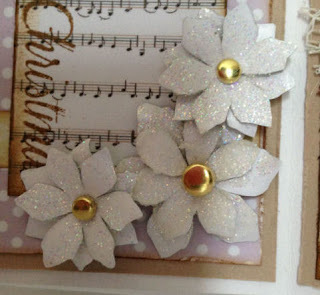 To embellish, I dunked some snowflake die-cuts into glossy accents, then into Glamour Dust to glitter. I've also used some teardrop lace and a selection of paper flowers too. Finally, my sentiment is taken from the Berry Wreath stamp set - I cut up each word and layered onto brown card rather than stamping it in a block! 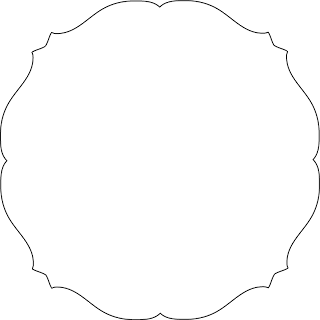 And here's the freebie shape.. hope you enjoy it! Hope you're all well - today I've got a template card for you. I've used the Triangle Box Card Template (which is on sale for just 50p - while stocks last!) and I've done some mixing & matching. I've used the Snowglobe stamp and the Baubles from the Christmas Owl Set as the main image. 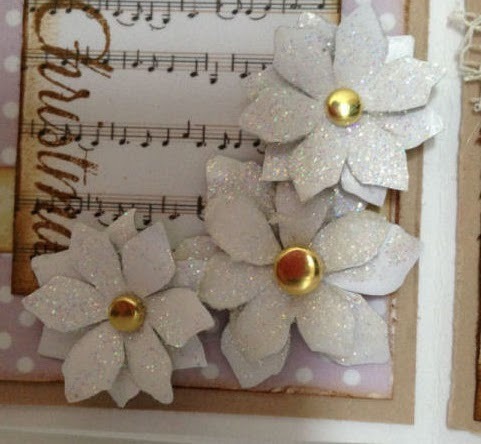 The snowflake that I've stamped over some papers is from the Let it Snow tree set. The sentiment 'Wish' is in the Snowglobe stamp set. The left hand panel 'Christmas' is from the Traditional Wreath stamp set and the sentiment on the right is from the Scandinavian Tree stamp set. I've used a metal corner that I've embossed with enamel (video tutorial here). The poinsettia's in the left panel are made using the Flower Shapes (1) stamp set. I've stamped them onto the back of white paper, cut out and turned over (so there's no black edge). I covered them in Glossy Accents and dipped the entire flower into Glamour Dust then layered them up with a brad in the middle. Also some die-cut snowflakes from Cuttables Vol. 2 that have been done in the same was as the poinsettias above (glossy accents & glamour dust). The sentiment on the right is from the Christmas Owl Set. I've been really inspired to use the Shoe stamp set for a wedding card just recently and I've finally got around to doing it! I've stamped the shoe image onto cream paper, printed from the Christmas Extravaganza CD, 4 times - I've used 2 shoes to paper piece and 2 as the base shoes. The backing papers used on this card are also from this CD Rom. I've used gold embossing powder to stamp the swirl from the Shoe stamp set onto the parts of the shoe I wanted to layer up. I've distressed it slightly using Gathered Twigs distress ink pad and then layered it onto a die-cut plaque. The sparkle around the edge of the plaque is included in the Shoe stamp set too. 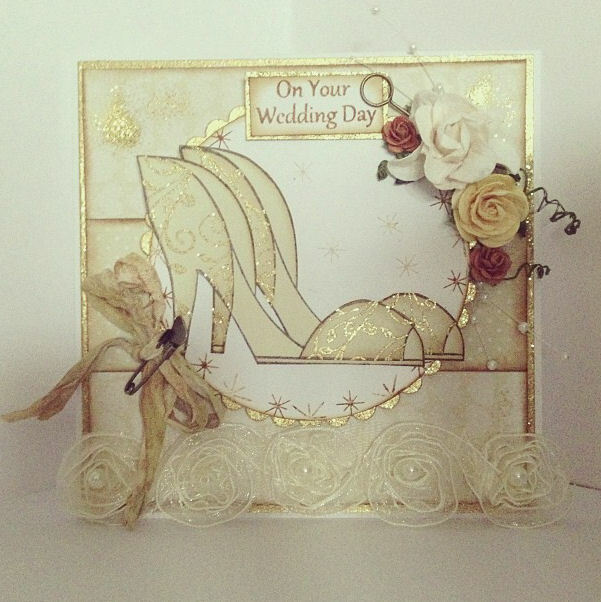 To create the gold edging, I've embossed around the edge of the layering pieces rather than using mirror card. I've used some Crinkle Ribbon (distressed with Gathered Twigs) and added a Trinket Pin in the centre to embellish. The sentiment is part of the Useful Sentiments (3) and it's poked into my flower arrangement using a Memo Pin, alongside some Pearl Sprays!